Name: CHAMBER EVENT: Love Your Chamber Day! 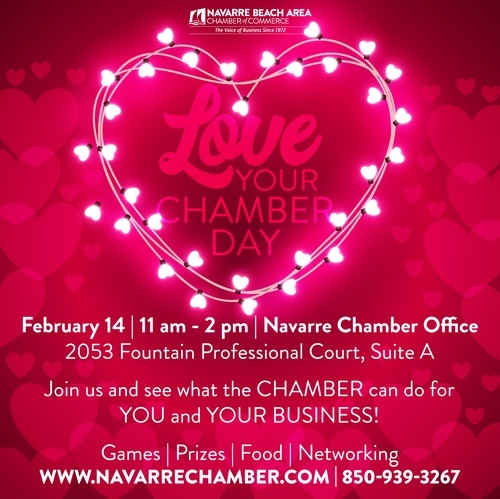 The Navarre Chamber will host a special “Love Your Chamber Day” Open House type event on Thursday, February 14, from 11 am to 2 pm at the Chamber Office, 2053 Fountain Professional Court, Suite A. This is a chance for friends of Navarre to meet some of the Chamber Team and learn about opportunities to become involved in events and local issues. Individuals can become "official chamber members" for $125/year. We also welcome local business owners and entrepreneurs to discover the benefits of Chamber membership. The Chamber will provide refreshments and host a raffle for prizes. Members receive a listing on the chamber website, publicity on through its social media, frequent word-of-mouth referrals and the ability to participate in chamber meetings, add events to the community calendar, and LOTS MORE!!! Everyone is invited to stop by our office for "Love Your Chamber Day" on Thursday, February 14 from 11 am to 2 pm! Have you ever been interested in joining The Navarre Chamber? "Love Your Chamber Day" will be a great opportunity to learn more about all the benefits Chamber Members can take advantage of - including FREE advertising!!! Come in on Valentines Day (February 14th) from 11-2. Join us and see what the CHAMBER can do for YOU and YOUR BUSINESS! This is a FREE event for everyone! !